When my husband get home from work, he is usually starving. Normally if he has been in meetings all day he doesn’t have long for lunch. So he is always asking ” What’s for tea?” Before I started maternity leave it was whoever was home first would start tea, now I’m home all the time it’s me! Therefore I’m getting back into my meal planning and stick it on the fridge each Sunday ready for the coming week. 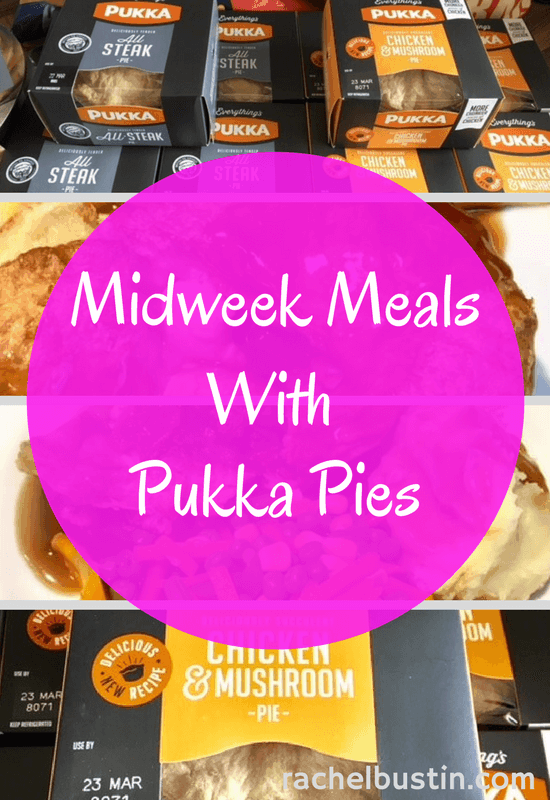 Midweek meals with Pukka Pies have become the norm lately with the cold weather we have had. 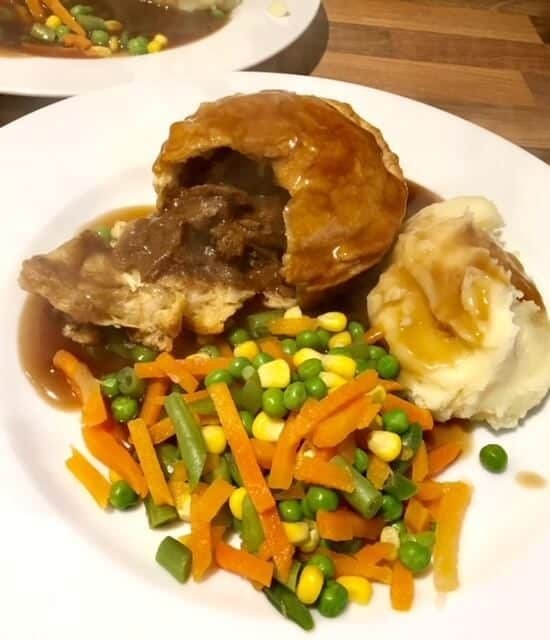 The good thing about Pukka Pies is the wholesome hearty meal that they provide. Teamed with mash/chips and veg, add a splash of gravy and you have the perfect midweek meal for hungry tums. 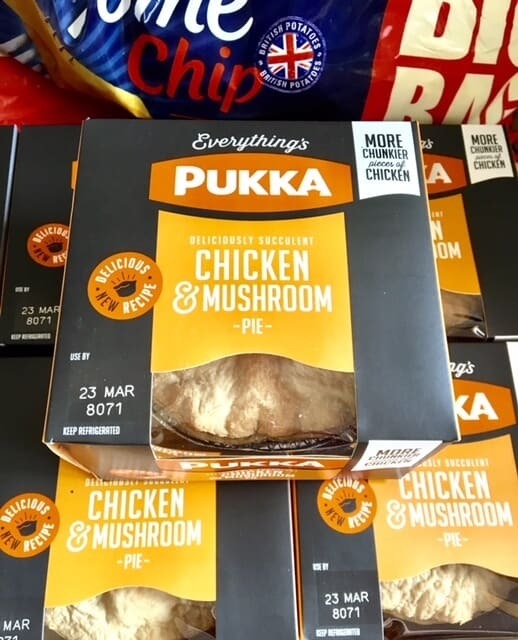 We were very lucky to receive a shopping delivery of Pukka Pies and some accompaniments to help us shape our midweek meals. I love the versatility with Pukka Pies. You can pop them in the freezer when you get home for eating at a later date. They are also fine for cooking from frozen. They practically go with anything! They are just as nice with some baked beans as well as vegetables. You can teem them with chips or mash. Are you team mash or team chips? I think we are both here, I love the comfort of eating pie and mash with gravy. On the other hand it’s always nice to have pie and chips. The pies are full of filling, light crispy pastry and extremely moreish. This goes for both the All Steak and the Chicken and Mushroom pies we were sent to try. The early “pyes” were predominately meat pies. Although early dishes that bear a resemblance to a pie have been around since the ancient Egyptians, the idea of enclosing a filling inside a sort-of-pastry made from flour and oil actually originated in ancient Rome. The first published recipe featured a decadent rye dough filled with goat’s cheese and honey. The pastry was not originally made for eating. Where nowadays, the pastry and filling are both eaten, the original pie pastry case was actually known as a coffin and its purpose was simply to hold the filling. It used to be stiff and inedible. The common phrase “to eat humble pie” may be thought of as being derived from its humble status, but in fact, the phrase derives from umble pie, which was a recipe containing the chopped or minced innards of an animal. The phrase has simply evolved by chance as an idiom over the years. The world’s largest ever meat pie weighed 10,540kg and contained 5,500 kg of British braising beef. This impressive pastry specimen was made by 17 catering students from Stratford-upon-Avon College on 12th April 1998. 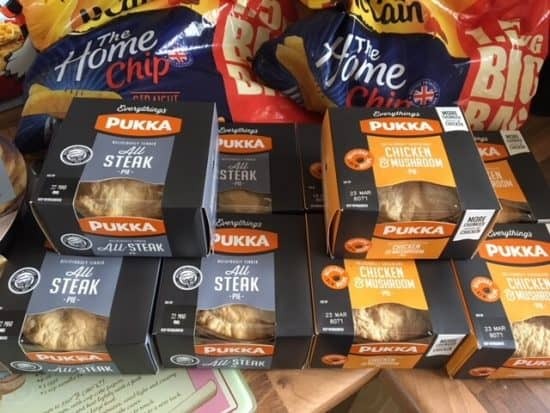 Pukka have a huge range of pies available including All Steak, Chicken and Mushroom, Deep Fill pies, Chicken and Gravy, Steak and Ale, Veggie Tikka Masala and many more! 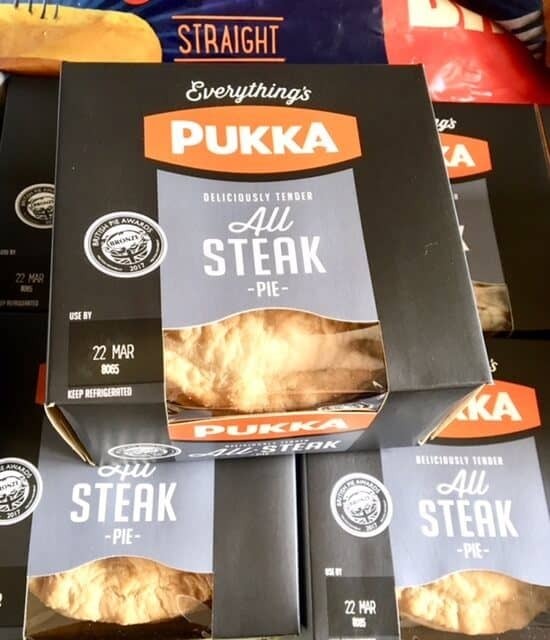 They were founded by the Storer family in Leicestershire in 1963, Pukka is an independent company with a passion for pies. 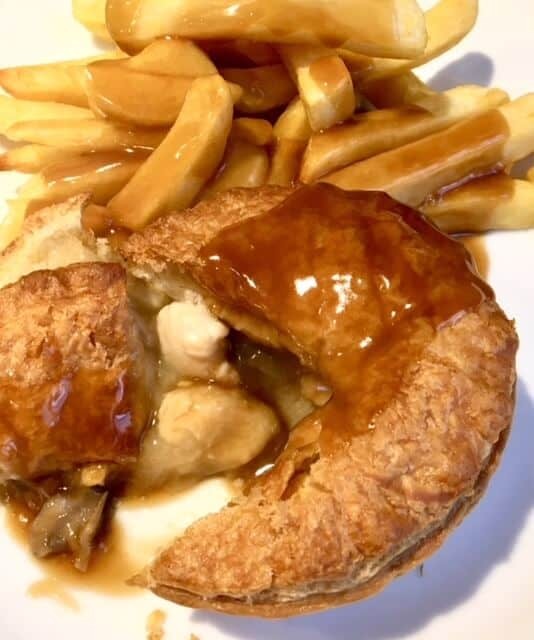 Supplying fish and chip shops and supermarkets with the highest quality light, flaky puff pastry with 144 layers, select cuts of meats and flavoursome gravies, Pukka Pies is now established as the UK’s number one Hot Pie Brand across the foodservice and grocer sectors. 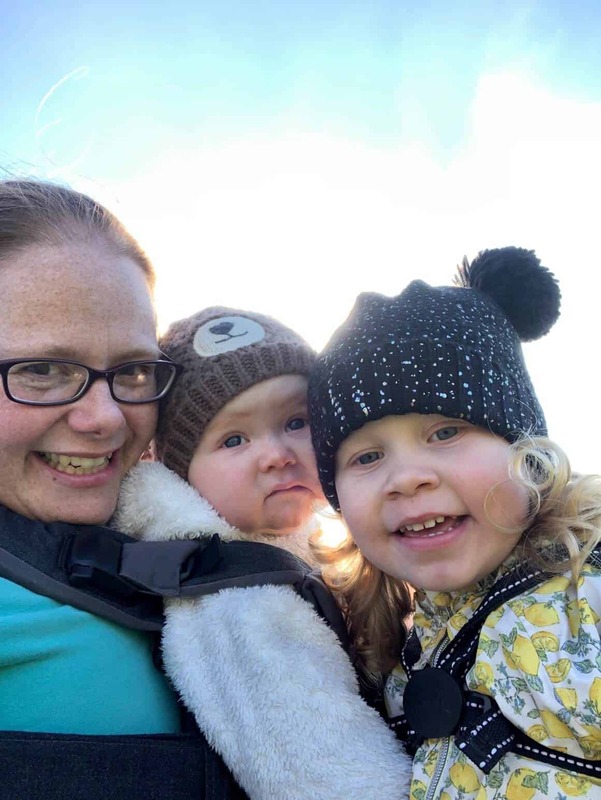 Employing 350 people local to the Leicestershire area, Pukka Pies takes pride in developing its people and providing jobs to passionate and specialised staff to give all of its customers the ultimate good mood food. Thanks for stopping by today, I hope you like our Pukka Pie post. 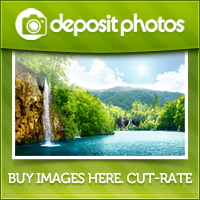 You can find our other “foodie posts” here. *We were sent a delivery of Pukka Pies, chips and mash for this post.